“County Planning Director Chris Price said the goal of the study, which is being conducted with the help of Annapolis-based Environmental Resources Management, is not necessarily to change current development rules for the county’s rural corridor, but rather to develop ‘clear rural policies and objectives’ to guide future planning decisions. “Price said the study comes about a year-and-a-half after some members of the Board of Supervisors began asking what other Virginia cities and counties are doing to preserve rural areas while balancing needs for new housing and infrastructure. “Back in 1998, the county established broad land-use rules for the roughly 100,000 acres comprising the Rural Crescent, a swath of land that traverses the length of the county west of Bristow and Vint Hill roads. Much of that land lies within the A-1 Agricultural zoning district, which limits development to one single-family home per 10 acres. “The study might conclude that no changes are needed, Price said, but 15 years is a long time to retain a policy without evaluating whether it’s meeting the community’s goals. “The first step, he added is to find out what residents and stakeholders want. 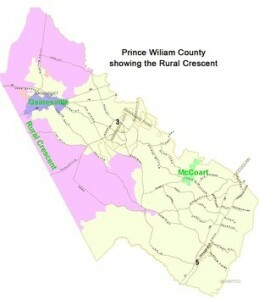 “Clive Graham, a representative with Environmental Resources Management, said the goal is to include a variety of rural area stakeholders – including those who live and own property in the rural corridor as well as conservation groups, community organizations and representatives from neighboring Prince William Forest Park, Quantico Marine Corps Base and Manassas National Battlefield Park. “Earlier on Thursday, representatives from those groups met for a focus group discussion at the county’s McCoart administration building, Price said. The goal of the evening session was to explain the study’s goals to area residents and begin gathering their input. “Many complied, voicing a range of opinions about the county’s A-1 zoning rule. “Some expressed support for the existing policy, which they credit for limiting sprawl and preserving open space by directing new growth toward existing population centers. “Others said the land-use rules unfairly limit the rights of rural property owners. “Charlie Grymes and Elena Schlossberg, both members of the smart growth-minded Prince William Conservation Alliance, said any new policies should consider the financial ramifications of increased development. ” ‘If you plant all these extra houses in the rural area, how does that affect traffic congestion?’ Grymes asked, noting that county taxpayers shoulder the burden of widening roads and building new schools necessary to accommodate residential construction. “It all seemed all too familiar to some residents, who said it felt like a return to earlier fights about land-use policies that ended in hurt feelings. “Price said the divergent opinions were not unexpected. “Residents were invited to submit written comments, and an online survey will soon be available on the rural preservation study webpage.